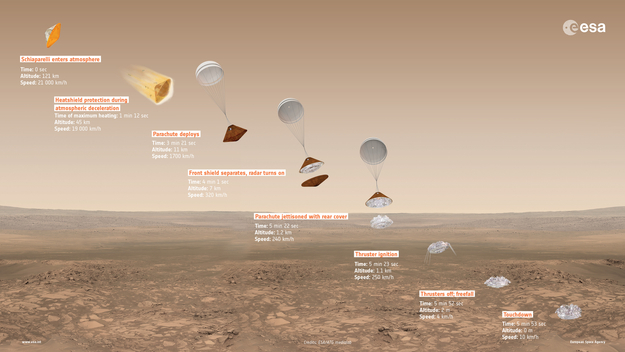 Overview of Schiaparelli's entry, descent and landing sequence on Mars, with approximate time, altitude and speed of key events indicated. Schiaparelli is scheduled to separate from the Trace Gas Orbiter (TGO) on 16 October 2016, three days before arriving at Mars. Twelve hours after separation, the TGO will perform a course correction to avoid entering the atmosphere, and will continue into Mars orbit. Then, on 19 October, Schiaparelli will enter the atmosphere at an altitude of about 121 km and a speed of nearly 21 000 km/h. In the three to four minutes that follow, it will be slowed by the increasing atmospheric drag, with the front shield of the aeroshell bearing the brunt of the heating. This will slowly melt and vaporise, allowing the absorbed heat to be carried away from the rest of the spacecraft. Once the speed has decreased to around 1700 km/h Schiaparelli will be 11 km above the surface and a parachute will be deployed. The parachute canopy will unfurl in less than a second, and, 40 seconds later, allowing for oscillations to die down, the front shield of the aeroshell will be jettisoned. The parachute will slow Schiaparelli to around 250 km/h, and then the back half of the aeroshell, with the parachute attached to it, will also be jettisoned. It will be drawn rapidly away from Schiaparelli, which will now be completely free of the aeroshell that had kept it safe en route to Mars. Schiaparelli will then activate its three hydrazine thrusters to control its speed. Radar will continuously measure the height above the surface. At an altitude of around 2 m, Schiaparelli will briefly hover before cutting its thrusters, leaving it to free fall. The touchdown speed will be a few metres per second, with the impact absorbed by a crushable structure similar to the crumple zone in a car, on the underside of the lander, preventing damage to the rest of the module. The entire entry, descent and landing sequence will be complete in less than six minutes.